Once again, I received a message from Roger Finch. 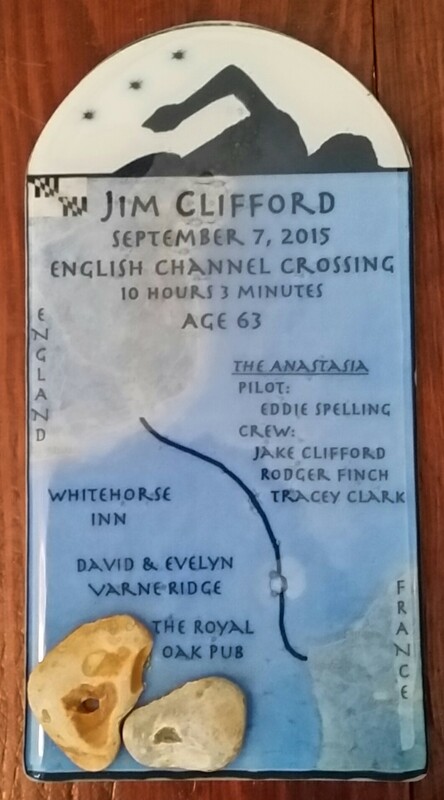 I need your help to crew Jim Clifford from Maryland, USA across the English Channel. Of course I said yes! Again, I had never met this person but the more I got to know Roger – I was beginning to realise two things. One, he loves to help! Two, he only helps those who are prepared to put the work in and listen. I trusted that Jim obviously fell into this category! 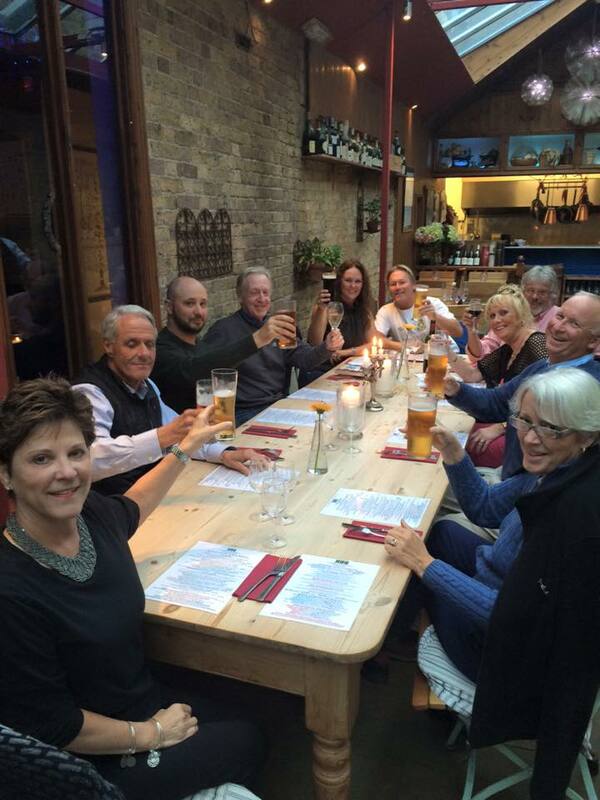 Before Jim’s English Channel swim, he and I would both be taking part in a 9 day swim camp in Ireland. This was perfect. I liked this man immediately upon meeting him. Jim smiles his way through life. I had met my match in smiles that’s for sure! Jim was using this camp to prepare himself for his English Channel swim and I was there for my Catalina Channel swim. We both share a passion for swimming and love a Guinness or two. My nurturing crew persona kicked in immediately. Making sure he was warm enough and returned safely from each swim. I also found out from Roger that Jim messaged him and said thanks Roger, this girl is perfect for my English Channel swim. Another dear friend made in this incredible sport. 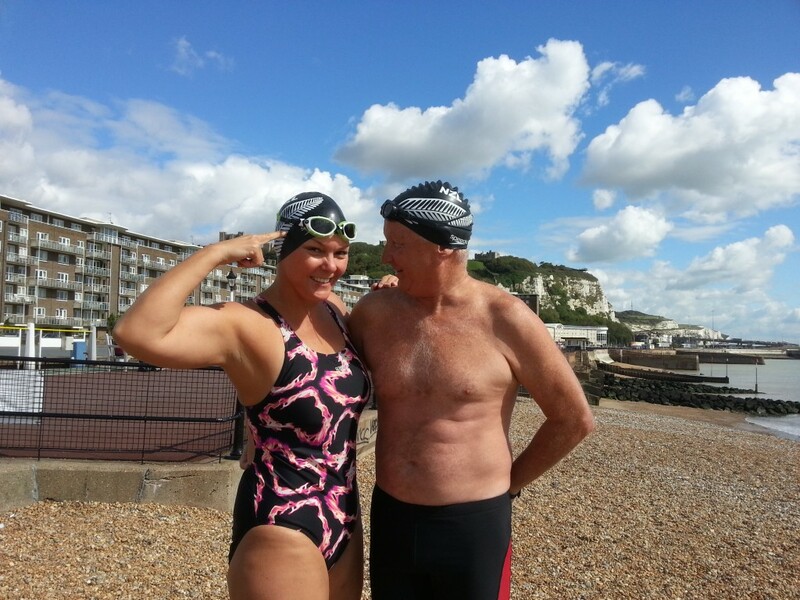 I turned up in Dover a few days before Jim’s swim, picking up Roger from Heathrow airport along the way. The deal was that Roger and Jim would help me prepare for my Catalina swim in return for helping to crew. On our second day, we took Jim to meet Captain Eddie and check out his boat Anastasia. Captain Eddie asked Roger and I what kind of swimmer Jim was. We could 100% say he is a no fuss swimmer, just happy to get the opportunity to give it a go and give it his all. The weather for the coming week was not looking great. 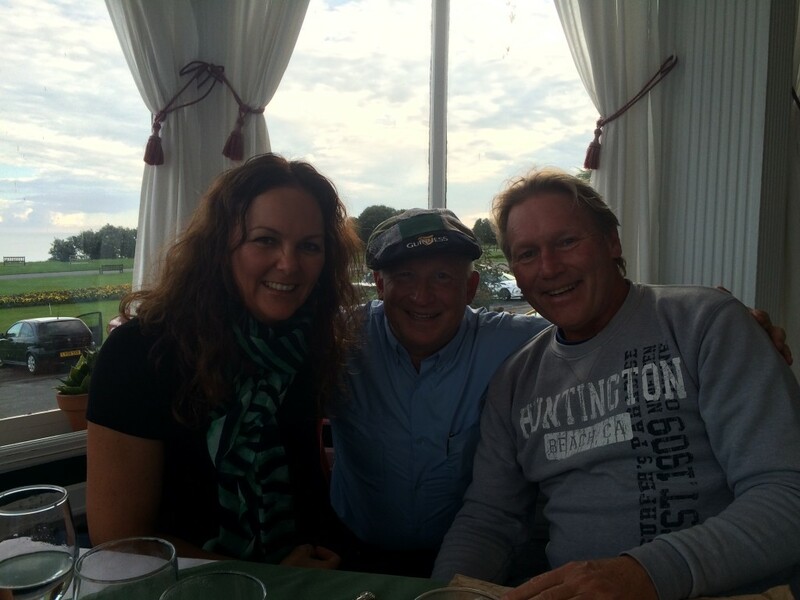 We also told Eddie, if it was rough but conditions were in the swimmer’s favour, Jim was great in the rough stuff. Two days later we got the call. It was going to be a rough day but the wind and swell was all heading towards France! 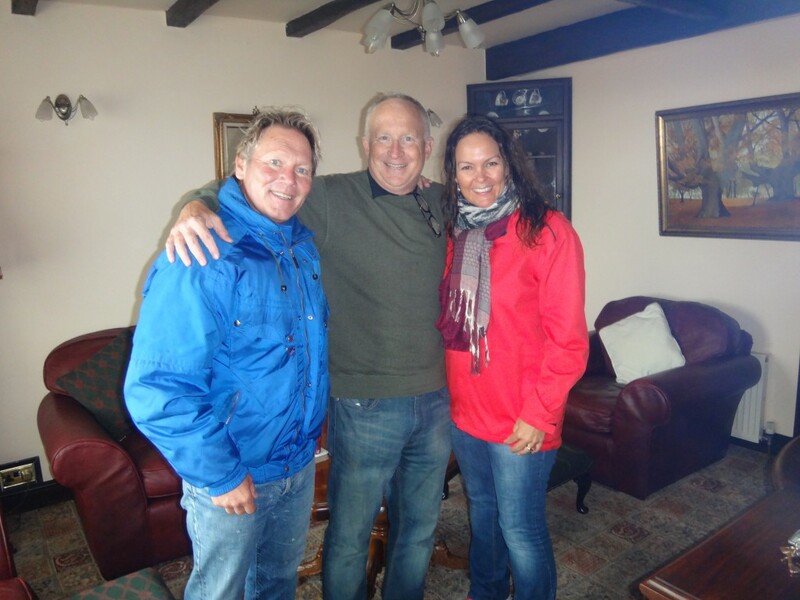 We met Jim at 4am out the front of the Varne Ridge Channel Swimming Accommodation. Both Roger and Jim pulled me over to the edge of the White Cliff’s of Dover and pointed to the stars. They both put their arms around me and Roger said “look at that, that is Orion’s Belt. Each time you breathe to the right in Catalina, you will see Orion’s Belt and I want you to think of this moment right now and know that Jim and I are with you and you will be safe”. This brought tears to my eyes as I knew I would store that away for when I would need it in a few weeks time. We met Eddie and his crew at the Dover Marina and made our way around to Shakespeare Beach. The sea was very rough, we were in for a bumpy ride to France. We had every faith in Jim though, he smiled his way through his greasing up and general preparation. Once the swim was underway, both Roger and I couldn’t believe Jim’s conditions. Yes it was rough with huge swells coming through and yes, you have to be an incredibly good swimmer to cope with conditions like that. 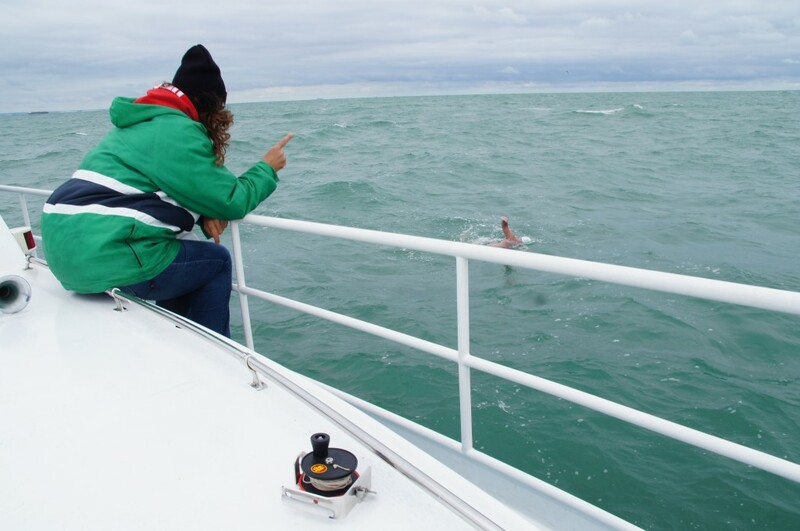 Jim swam so comfortably and then a big swell would give him a nice push forward. We sat there watching over him quite envious!!! Jim’s energy levels and stroke didn’t falter at all. I decided to start pushing out his feeds from every 30 minutes to 35, then 40…until we got to 45 minutes. 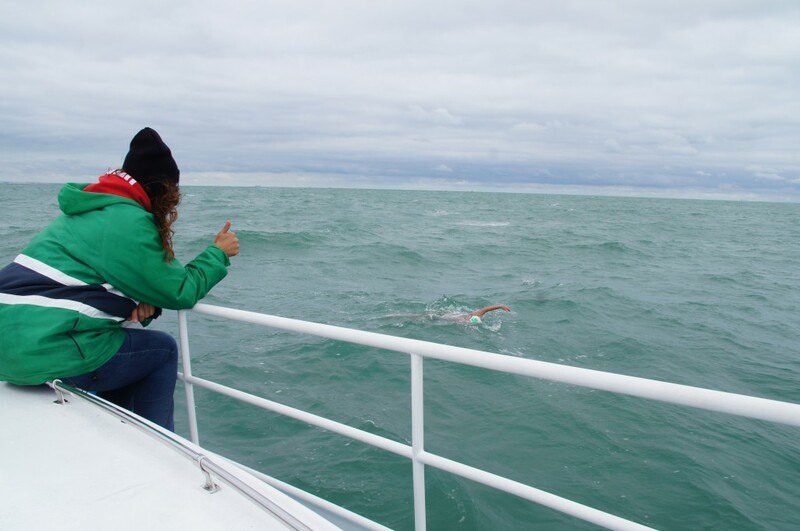 We liaised with Captain Eddie throughout the swim and it was predicted that Jim was on target to complete his Channel swim in a very fast time. We stretched out his feeds to help give him a faster time. Something we would only do of course if it didn’t affect the energy levels of the swimmer. Jim didn’t even notice! We had also come up with a nice treat for when Jim reached French waters. I would put peaches in his feed box and this would be a signal that he was well on the way to achieving his dream. When swimming any of these swims, one of the most important skills to learn is, peeing and swimming at the same time. Jim took his feeds really fast, but would then take about one minute to tread water and pee (sorry Jim – no topic is sacred in this sport…it’s already in the Washington Post so I know you won’t mind me mentioning this)!! As we got closer to France and knew he really was on target for an incredibly fast time, we yelled at him to get a move on each time! Finally it was time for Roger to swim him in. Both of us wanted to but conditions were such that it was only safe for one of us to do this. He jumped in and I watched these two dear friends swim to France. Both achieving dreams. 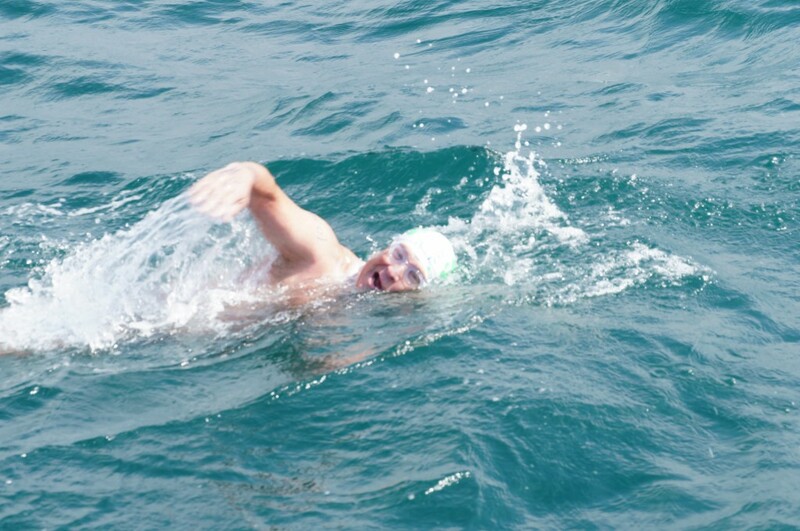 Jim was about to complete not only his English Channel swim but the third of his Triple Crown swims. For Roger, once again he was swimming in a dear friend to France. A feeling just as good as achieving this yourself. I saw them climb out of the water up onto a rocky shoreline with it’s very own bunker!. They cleared the water and hugged. Captain Eddie announced his time was an amazing 10 hours and 3 minutes!!! I noticed a large group of people on shore dressed in black. One of the men started making his way towards Jim and Roger. Captain Eddie, his crew and I kept an extra close eye on this. Roger always carries a waterproof camera down his Speedo. This day was no exception. Roger videoed Jim swimming in. He then gave the camera to this friendly stranger and filmed an interview with Jim. They then both swam back to the boat. We helped Jim onto the boat and his son Jake took over the care of his father, drying him and getting him warm. Jim immediately asked what his time was and I told him. Jim replied “oh darn it, if I was a little faster I could have been under 10 hours”! I knew this would be his response and I replied “well Jim, if you learnt to pee and swim at the same time you would be under 10 hours”. Little did I know that I would be quoted as saying that in an article in the Washington Post!! I helped Roger back onto the boat and took one look at his face and I knew something was terribly wrong. With tears in his eyes he said “my camera’s gone”! I teared up too as I completely understand how precious and irreplaceable these photos and a “Roger” video is at the end of a swim. There was nothing I could say except “hey, we got our friend to France and helped him achieve his dream, that is something we will all have in our hearts forever”. The journey back to England was incredibly rough against the swell! Jim pulled out a bottle of Jameson’s and insisted we all have a swig in celebration. He was now a Triple Crowner – and the oldest person ever to do that at the young age of 63. Ironically, Jim also broke Otto Thaning’s over 50 English Channel record by 26 minutes. What amazing friends I have. Thanks so much Jim for having me as a part of your team and for the precious glass plaque you had made for me – featuring our beloved Orion’s Belt. I loved every minute of it. Thanks again to Roger for asking me to crew. With each swim I learn more and love this sport even more if that’s possible.